LG Display is set to unveil a new roll-printing TFT technology this month, which could lead to even cheaper LCD TVs, laptops and computer monitors. The roll-printing process is designed to replace the existing photolithography stage on LG's TFT-LCD production line. A TFT is essentially a circuit that’s formed with semiconductor films on a thin glass substrate to control liquid crystals in an LCD panel. Photolithography, in turn, is the process of forming the actual circuit patterns on the TFT and colour filter substrate. Photolithography is a complex and expensive series of processes. 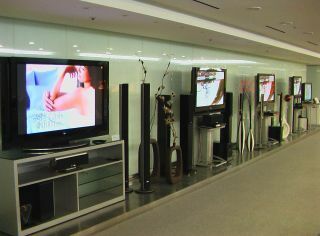 It’s a critical step in the LCD manufacturing process because panel quality depends on the formation of the TFT pattern. As such, part-built TFT-LCD panels are extremely sensitive to contamination. So the multi-stage photolithography process requires a special clean room environment and precise control of equipment, chemicals and raw materials. According to LG, its new roll-printing technology combines the various stages of the photolithographic processes into one. It’s expected to help reduce overall equipment costs, clean room investment and to shorten the production time of TFT-LCDs. The roll-printing process is also more environment-friendly, says LG, significantly reducing the use of chemicals. "LG Display’s TFT roll-printing technology will give us a strong lead in the market for next generation printing technologies," said In-Jae Chung, LG Display’s Chief Technology Officer and Executive Vice President. "We will continue to pioneer the development of cutting-edge display technology to effectively meet our customers’ current and future needs." LG is looking ahead to future demand for bigger, higher performance LCD panels. The new roll-printing technology is also ideal for the next-generation of thin and flexible displays. The technology will be unveiled at the Society of Information Display 2008 show that starts May 20.